Download Hour1 Download Hour2 As we approach the climax of David Graeber's Debt, The First 5000 Years, we begin a series of talks by Economics Professor Richard Wolff introducing Marxian class analysis. Economist Richard Wolff introduces what he calls 'an elaborated system with so much to offer' - that is, Marx's concept of 'class', which has been a main focus of Professor Wolff's life work. He explains what was new about it and why he thinks it such a useful tool to understand societies. His talk focuses on USA, and how Marx's framework reveals unspoken truths about capitalism as it operates in USA. He introduces the Marxian idea of surplus, which applies wherever work is being carried out. Marx's tools are not limited to the world of business; he notes that traditional domestic arrangements are 'exploitative' by Marx's definition, something which might seem shocking to a lot of Americans, since the Marxian analytical tools are unavailable to them. I removed a few minutes of silence, corrections and hesitations from Wolff's lecture, which continues into our second hour, allowing just a few minutes from our ongoing reading of Debt, The First 5000 Years. Echoing Noam Chomsky's point from episode 622, David Graeber reminds us that after the end of the Cold War, far from being dismantled, the military machine was ratcheted up. The truth is, he says, that the rationale of defense from the foreign threats was not the main purpose. 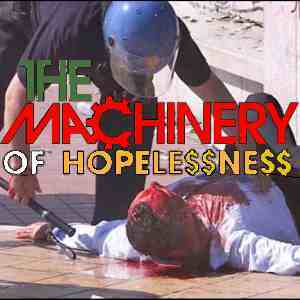 More important was its role as part of what he terms "The Vast Machine To Perpetuate Hopelessness". To begin to free ourselves, Graeber writes, the first thing we need to do is to begin to see ourselves as historical actors whose actions can make a difference. I hope that this how will help you to do that, and to that end we'll continue next week with another of Professor Wolff's lectures on Marxian economics. This page was last modified on 30 October 2012, at 19:58.